Whether you live here or you’re vacationing here during Christmas week, it can be overwhelming trying to decide from among all of the fun holiday offerings happening in the Orlando area. Every year, ICE! at Gaylord Palms picks a new theme for each new holiday season. This year, they chose the classic film, “A Christmas Story,” and did an amazing job bringing the movie to life in frozen vignettes. Whether you live here or you’re vacationing here during Christmas week, it can be overwhelming trying to decide from among all of the holiday offerings happening in the Orlando area. Christmas at Gaylord Palms is in full swing for the 2016 holiday season, and the centerpiece of the celebration is ICE!, which this year tells the story of A Charlie Brown Christmas. Carved out of more than 2 million pounds of ice by artisans flown in from China, the classic Christmas tale is told in life-sized full-color ice creations. 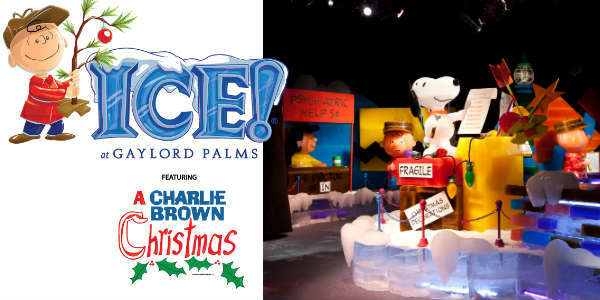 It may be July, but Gaylord Palms is already planning for their annual Christmas festivities, including ICE!, which this year will feature A Charlie Brown Christmas by Charles Schulz. Watch Charlie Brown rediscover the true meaning of Christmas as the beloved classic story unfolds through interactive ice sculptures and displays. All hand-carved from 2 million pounds of actual ice by Chinese artisans. 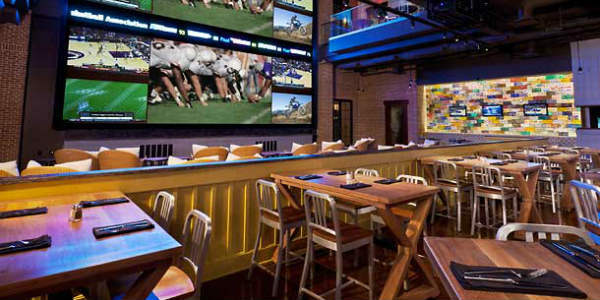 The chefs at Wreckers Sports Bar at the Gaylord Palms have teamed up with the brew masters at Funky Buddha Brewery to craft a one-of-a kind seasonal dining experience on August 21. Indulge in a locally-sourced five course menu – including a “mystery course” – perfectly paired with a selection of beers from Funky Buddha. Yesterday we told you about the all-new ICE! that will be coming to the Gaylord Palms Resort this holiday season, now here are the rest of the reasons this year’s Christmas at Gaylord Palms will be a must-do. So, a display of nearly 2 million pounds of hand-carved ice isn’t enough for you? Gaylord Palms isn’t done yet. For starters, Alpine Rush Snow Tubing is returning to the resort for the holidays. Once again there will be an 18’ 8-lane giant snow hill created with 1.5 million pounds of real Florida snow to slide down. I did this last year and I think I enjoyed it as much as the kids. Posted in Orlando / Central Florida Lodging, Orlando Holidays	- Tagged Christmas at Gaylord Palms, Christmas events, Cirque Dreams, Elf on the Shelf, Gaylord Palms, ICE! ICE! is one of the best seasonal attractions in Orlando, and Gaylord Palms Resort has announced the theme for this year’s event. After doing cartoon themes in 2012 and 2013, ICE! is going with the classic theme of The Nutcracker. The story of the ballet will be told via 2 million pounds of hand-carved ice sculptures created by artisans from Harbin, China. The ice nativity scene will also be returning, as will the ice slides, which are fun for kids of all ages. Tickets are $29.99 for adults and $16.99 for kids 4-12 at he door, or buy in advance and save. Florida residents use promo code FLR14 to save $4 per ticket. ICE! featuring The Nutcracker will run at the Gaylord Palms Resort from November 15, 2014, through January 4, 2015. 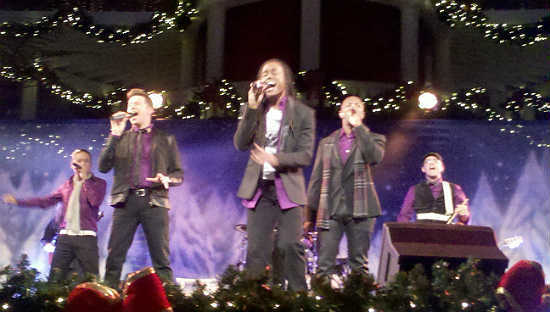 For more information, or to purchase tickets, visit christmasatgaylordpalms.com. Join members of the Orlando Polar Bear Club on Sunday, December 8, and take a waltz through ICE! at the Gaylord Palms in nothing but your swimsuit or summer attire. Normally a walk through the Holiday attraction requires a parka, hat, and gloves. But on this night, dress like you would on a hot summer day in Florida, and walk through the 9 degree temperatures, enjoying the story of Frosty the Snowman. The event will take place from 7am-9:30am, and admission is $18.99 (plus tax). I will warn you, any exposed skin may feel a sting once you’re done. To purchase tickets, visit the Gaylord Palms page at Marriott.com. Friday night we were invited to a media preview of this year’s ICE! at the Gaylord Palms in Kissimmee. After we checked in, we went to the atrium where a stage was set up. Enroute, we got to have our photos taken with Puss in Boots, which was awesome. Unfortunately, when we went back later to get the photo, we found out the camera card was corrupted and our photo was lost. Prior to viewing ICE!, were treated to a show called Luminescence, which features a live band with four singers performing classic Holiday songs. Highlights of the show included the drummer playing a circular kit in the air, and two aerialists performing amazing routines on hoops and ribbons. Luminescence is performed every night following the Christmas tree lighting at 6:15pm, through the end of December. Posted in Orlando Holidays, Out and About Reviews	- Tagged family friendly events, Frosty the Snowman, Gaylord Palms, holiday events, ICE! 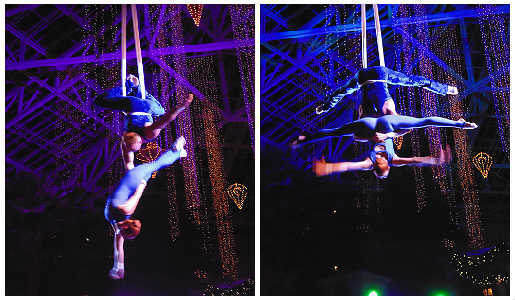 We were blessed to be able to get a sneak peek of the Gaylord Palms Resort’s Holiday show, ICE!. I am amazed at how cold they can keep those rooms in order to maintain the sculptures. 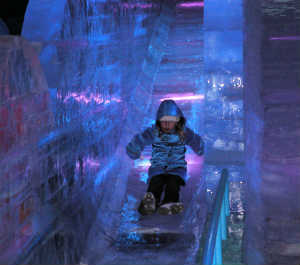 A slide made out of ice at ICE! As a parent of 2 small children, ages 7 and 4, I was excited to see their reactions. We love the Madagascar movies by DreamWorks and are familiar with the characters. The first thing that you notice is the 9 degree temps, and for Florida kids, that is really cold. Once you catch your breath, the vibrant colors are just amazing! The amber of Alex’s fur in ice is actually the color of his fur! That always amazes me. The scenes chosen to be created in ice told the story very well and in a logical order. As we wound our way through the scenes, I felt like a fly on the wall as everything is so large in scale. It was as though we were participating in the story, but not really. Kind of like it is in dreams. I thought it was cool (no pun intended). The best part, according to my children, was the ice slide area. The 7-yr-old went down them often, and her only complaint was that they were not slippery enough yet and she had to scoot her way down, although that should change with use. They are fun and good for kids of ALL ages! I know because yes, I went down it too, as did my husband and my sister. And we have photos proving we did it. The slides are about half way through the adventure and by about that time, my 4-yr-old was getting cold and wanted to move on. So we did, after a couple more slides. Friday night (11/09/12), CitySurfing Orlando was invited to a media preview of this year’s ICE! attraction at Gaylord Palms Hotel. The evening started with food and drinks in the St. Augustine Fort area of the hotel’s atrium. There were carved meats, decorate your own gingerbread cookies, and even a special drink created for the event. Called the ICE-tini, it consisted of cinnamon-infused whiskey, apple cider, and cranberry juice, with a fresh cranberry for a garnish. I have to admit I’m not usually one for whiskey-based drinks, but this was pretty good. The media then was treated to a preview of the new Luminescence stage show, featuring the vocal harmonies of The Edge Effect singing Christmas carols. The singers and musicians sounded very polished and were very talented. The show was also enhanced visually by the addition of an aerial acrobat and a drum ring that lowered from the ceiling – as the drummer was playing. Great visuals! The evening finished up with a tour through ICE! ICE! is over 20,000-square-feet of hand-carved ice sculptures, created by a team of 40 artisans from Harbin, China. It is set in a tent kept at a chilly 9 degrees. The majority of the floor space is an all-new tribute to the DreamWorks Animation TV Christmas special, Merry Madagascar. 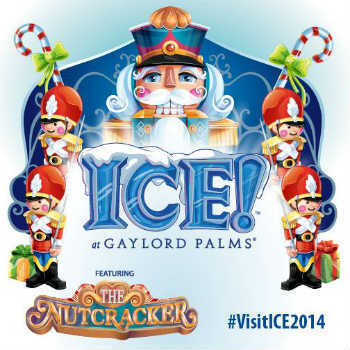 Yesterday, Gaylord Palms Resort held their annual Christmas in July event to reveal the theme for this year’s Ice! attraction. 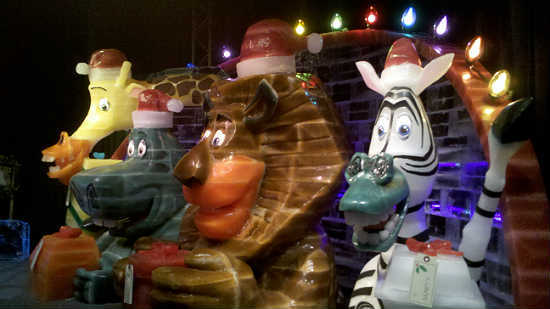 In keeping with their partnership with Dreamworks Animation, Merry Madagascar will be the theme. To help with the announcement, characters from the hit Madagascar series of films were on hand, along with a few characters from Shrek. The event was held around the resort’s new Cypress Springs Family Fun Water Park, and I wish I would’ve known they were allowing kids to try it out. Carol, our family writer, brought her two children and they really wanted to play on the slides and get drenched by the big bucket of water. Heck, if I wasn’t wearing jeans, I might of jumped in the pool. It was that hot out. As we entered the pool area, we were greeted by several Shrek characters. Shrek, Fiona, Puss and Gingy were mingling and taking photos with the guests, which included children from the Boys & Girls Clubs of Central Florida and Give Kids the World. 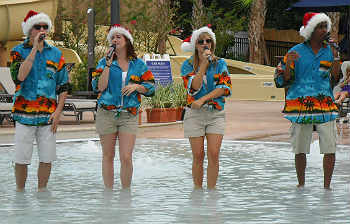 A quartet of singers serenaded the crowd with holiday songs, while standing in the zero-entry end of the pool. There was also a snack area with drinks and sugary treats like frosted brownies, chocolate-covered ginger cake lollipops and egg nog ice cream push-ups. 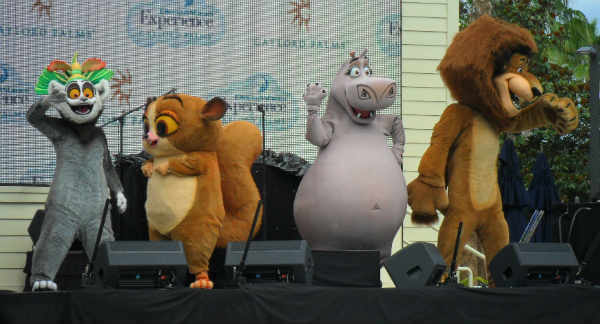 Alex (the lion), Gloria (the hippo), King Julien and Mort (the lemurs) took to the stage to help make the announcement for this year’s Ice! theme. I love Mort! After the characters left the stage, a DJ came on in a wall of fog. Then the musical guest took the stage. In keeping with the fact that this event was about Ice! 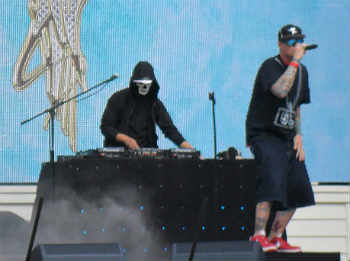 it was a fun surprise to see Vanilla Ice onstage singing, “Ice, Ice, Baby!” Word to your mother. Following the event, the characters went inside to the resort atrium, where they continued to take photos with guests. There were even Penguin sightings (from Madagascar)! Ice! 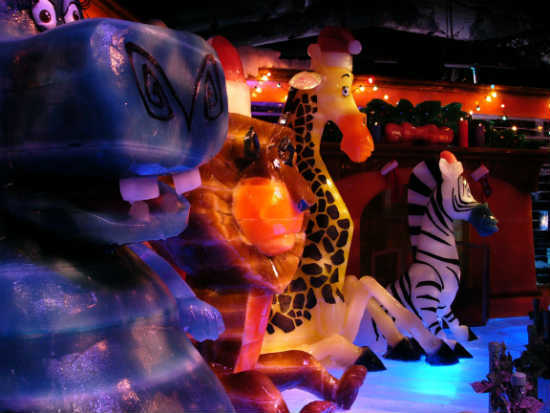 is an annual holiday attraction that features over 20,000-sq-ft of hand-carved ice sculptures and slides. This year, it is open from November 10 to January 1, 2013. At the door ticket pricing runs from $25.99 to $29.99 for adults, based on peak seasons (ie: expect to pay more during Christmas week). Seniors and children receive discounts. However, you can save even more on all tickets by buying them in advance at christmasatgaylordpalms.com. Posted in Orlando / Central Florida Lodging, Orlando Holidays, Out and About Reviews	- Tagged Christmas, DreamWorks Animation, Gaylord Palms, holidays, ICE! 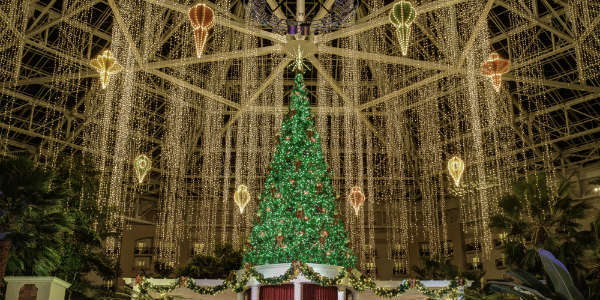 Our family blogger, Carol Garreans took her kids to the Gaylord Palms event on July 19 to see the official announcement of this year’s holiday events. She took plenty of photos as the hotel announced that the four Gaylords nationwide were partnering with DreamWorks Animation to produce this year’s ICE! and Snow! events. At the Gaylord Palms, Shrek will be the theme for ICE!, an annual attraction that features custom-carved ice sculptures in a extremely cold tent area. Shrek, Madagascar and Kung-Foo Panda characters will also be present throughout the hotel via character breakfasts and more. Following the announcement ceremony, the various DreamWorks characters were available for photos, and Carol made sure her family got in on that. The hotel also served up a table of sweets and baked goods for the crowd in attendance. The Gaylord Palms resort in Kissimmee is reaching out to local foodies with a new wine-and-dine membership club. For $150 per person, or $240 per couple, members in the Cork & Fork Club get priority invitations to select culinary events, and access to a private culinary concierge. Members also enjoy benefits such as a free night’s stay, 20% discounts at resort restaurants and lounges, a $50 spa voucher for a 50-minute treatment, and more. The resort boasts a number of dining experiences including the Old Hickory Steakhouse, Sunset Sam’s Fish Camp, South Beach-style sushi at Sora and the Mediterranean-inspired Villa de Flora. Not sure if membership is for you? The Gaylord Palms will be hosting a launch party for the Cork & Fork Club on September 22, 2010. The resort will be offering samples of food and wine from its restaurants, and the $25 per person fee to attend can be applied towards the membership price. Call 407-586-0708 for more information.